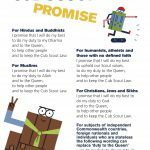 There is core flexibility in the age range: young people can join from age 7½ and can move to Scouts between age 10 and 11. It may sometimes be appropriate to extend this flexibility for young people with additional needs. Syston’s Cub Pack meet on Thursday Evening’s from 18:45pm to 20:15pm.